Despite all the potential therapeutic implications,13 our understanding of the biological and pathological roles of this intriguing gas is still in its infancy. However, for any study of its biological functions, it is important to take the concentration at the site of action into first consideration. As such, it is crucial to have in place robust assays to monitor the biosynthesis, transport and catabolism of H2S in living cells, tissues, as well as whole organisms. Traditional methods for H2S detection, including the methylene blue assay.14 sulfide-selective electrodes6 and gas chromatography15 are generally limited by their invasive and destructive nature to live organisms. On the other hand, small fluorescent probes confer the advantages of high sensitivity and good cell permeability, and have therefore attracted the most attention for sensing and visualizing analytes inside living cells. A number of probes have been recently developed for the fluorescence detection of H2S in biological systems. These probes, judiciously designed by taking advantage of nucleophilic, reductive properties of H2S or its high binding affinity towards copper, can react specifically with sulfides with a fluorescence output signal indicating the presence or even concentration of H2S in biological systems.16-27 However, previous H2S probes are based on traditional planar aromatic chromophores which are only fluorescent in dilute solutions since high concentrations usually induce aggregation-caused quenching (ACQ) effect resulting from the strong π π stacking interactions upon the aggregation formation.28 ACQ is generally considered harmful to practical applications because of the significant detection errors incurred. Unfortunately, traditional discotic fluorophores are usually highly hydrophobic and therefore easily aggregate in the aqueous biological contents. Although their hydrophilicity can be improved by the attachment of water-soluble functional groups, the resultant products are still vulnerable to ACQ in aqueous media due to the unalterable hydrophobicity.28 Novel probes with unique luminogen mechanism suitable for the specific detection of H2S in high aqueous contents are thus still highly desirable. Aggregation-induced emission (AIE), first reported in 2001, is a unique phenomenon that propeller-shaped fluorophores are non-emissive when molecularly dissolved but are highly fluorescent upon aggregation.29 It is proposed that these molecules cannot pack through a π π stacking process due to the propeller shape in the aggregate state, which restricts the intramolecular rotation, blocks the non-radiative pathway and opens up the radiative channel, leading to aggregation-induced emission.28 AIE is particularly attractive for biological aqueous environment and have showed diverse applications in cell imaging and bioprobes.30-33 However, AIE-based H2S-targeting probes are still unavailable. Here in this work, we disclose our related research efforts which resulted in the first probe with AIE characteristics for the sensing of biological H2S. The probe, namely AIE-S, demonstrated high specificity and sensitivity. Its feasibility to monitor H2S in live cells was also confirmed. Dry ethanol was distilled from sodium prior to use. Water was purified by a Millipore filtration system. Other chemicals and reagents were from commercial supplies and used without further purification. Reactions were monitored by thin-layer chromatography (TLC) carried out on Silica gel 60 F254 plates supplied by Qingdao Puke Separation Material Corporation using UV light as the visualizing agent. Flash column chromatography was performed using 200-300 mesh silica gel supplied by Qingdao Marine Chemical Factory, Qingdao, China. 1H and 13C NMR spectra were recorded on a Bruker Fourier transform 400 NMR spectrometer at 25oC using CDCl3 as solvent and were calibrated referencing residual undeuterated solvent as an internal reference (1H NMR = 7.26, 13C NMR = 77.16). All chemical shifts were given in ppm and coupling constants (J) in Hz. The following abbreviations or combinations thereof were used to explain the multiplicities: s = singlet, t = triplet, m = multiplet. IR spectra were recorded on a Bruker Vector 22 spectrophotometer as KBr pellets. High resolution mass spectra (HRMS) were recorded on an Agilent 6224 TOF LC/MS spectrometer using ESI-TOF (electrospray ionization-time of flight). Absorption spectra were acquired using a Hitachi U-3010 spectrophotometer. Fluorescence measurements were carried out on a Perkin-Elmer LS 45 fluorescence spectrometer. Dynamic light scattering (Beckman-Coulter DelsaTM Nano-C particle analyzer) was used to determine the size of the aggregated particle colloids in aqueous solution. To a stirred solution of tetraphenylethene aniline (200 mg, 0.576 mmol) in dry ethanol was added salicylaldehyde (3.00 mL, 28.7 mmol). The reaction was allowed going at ambient temperature under N2 atmosphere for 1 h. A yellow precipitate was formed gradually which was isolated by filtration and further purified by flash column chromatography on silica gel (petroleum ether/CH2Cl2, 5:1) to afford AIE-S as a yellow powder (234 mg, 90% yield). Rf = 0.45 (10:1 petroleum ether: EtOAc). 1H NMR (400 MHz, CDCl3), δ (ppm): 13.30 (1 H, s), 8.59 (1 H, s), 7.37 (2 H, t, J 7.0), 7.15-7.01 (20 H, m), 6.93 (1 H, t, J 7.4). 13C NMR (100 MHz, CDCl3), δ (ppm): 162.07, 161.29, 146.43, 143.75, 143.72, 143.67, 142.87, 141.54, 140.29, 133.16, 132.57, 132.30, 131.50, 131.47, 131.45, 127.98, 127.90, 127.80, 126.76, 126.73, 126.66, 120.68, 119.38, 119.15, 117.36. IR (cm-1): 3420, 3025, 1618, 1567, 1493, 1450, 1279, 1181, 753, 696. HRMS (ESI-TOF): m/z 452.2018 [M+H]+, calc'd. 452.2014. N-(2-hydroxyethyl)piperazine-N'-2-ethanesulfonic acid buffer (HEPES, 10 mmol, pH 7.4) was prepared with purified water and purged with nitrogen for 5 minutes before use. AIE-S was dissolved in THF to make a 200 μM stock solution, which was diluted to 20 μM with HEPES for measurements. CuCl2 and Na2S were dissolved in the deoxygenated HEPES to make a stock solution of 1.0 mM. The spectrometer slit width of excitation and emission was adjusted to 5 and 10 nm, respectively, for measurements. All fluorometric experiments were performed at room temperature in triplicate. 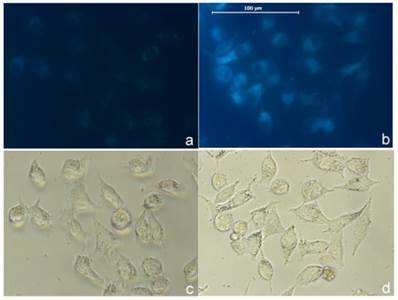 HeLa cells were cultured in DMEM supplemented with 10% fetal bovine serum in a humidified atmosphere of 5% CO2 at 37°C. For imaging experiments, exponentially growing cells (at a density of 20000-40000 cells per well, respectively) were seeded in 24-well plate. Cells were cultured at 37°C in a 5% CO2 atmosphere for 24 h before they were exposed to reagents. After the staining steps as described in figure captions, the images were collected upon excitation using the corresponding filters for DAPI (blue). AIE-S was designed by fusing a Cu2+ chelating salen group which functions as a water solubility-adjusting group, to tetraphenylethene, a typical AIE fluorogen.28 The philosophy of our design is as follow. Existing as aggregates, AIE-S in aqueous solution would be highly fluorescent, while treating AIE-S with Cu2+ would lead to fluorescent quenching due to the improved water solubility of the AIE-S-Cu2+ complex. However, ascribed to the high binding affinity between S2- and Cu2+, Cu2+ would be de-coordinated from the complex in the presence of S2- to release the less miscible AIE-S and therefore trigger the restoration of the luminescent property of the system due to the increased local concentration and thereof the aggregation of AIE-S (Fig. 1). The synthesis of AIE-S was straightforward via the reaction between salicylaldehyde and tetraphenylethene aniline with the latter being prepared according to reported procedures.34 It was obtained as a yellow powder in a yield of 90% and characterized by NMR and high-resolution mass spectroscopy. With AIE-S in hand, we first investigated its photoluminescent property. AIE-S is soluble and thus non-emissive in tetrahydrofuran (THF). Its solubility decreased gradually as the volume fraction of HEPES buffer (10 mM, pH = 7.4) increased. The system reached its threshold when the buffer fraction increased to 70%. In the THF-HEPES (3:7, v/v) mixture, AIE-S was still weakly fluorescent even though the system showed an average particle size diameter of 214.0 nm. When the buffer fraction was greater than 70%, the system exhibited obvious emission peaked at 533 nm which intensified as the buffer fraction increased (Supplementary Material: Fig. S1). These results indicated that AIE-S was a typical fluorogen with aggregation-induced emission characteristics. 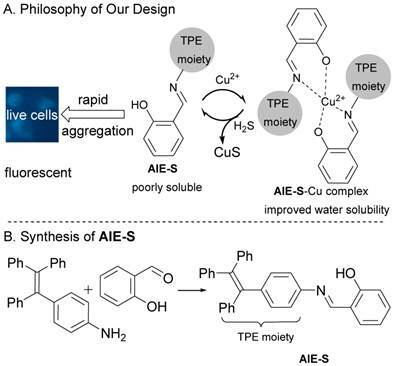 The philosophy of our design and the synthesis of AIE-S.
Next, the fluorescent responses of AIE-S towards various concentrations of Cu2+ were studied. Experiments were carried out in HEPES buffer (10 mM, pH = 7.4, 25oC, 10% THF). As shown in Fig. 2, the blank solution of AIE-S (20 μM in the buffer) exhibited intense fluorescence peaked at 533 nm, while the addition of increasing concentrations of Cu2+ gradually attenuated the fluorescent signal and 95% quenching was observed when 0.5 equiv. Cu2+ was added. The coordination between Cu2+ and AIE-S was confirmed by UV-Vis absorption spectra analysis (Supplementary Material: Fig. S2). AIE-S showed an absorption band stretching from 320-470 nm with the maximum peak centered at 375 nm assigned to the lowest-lying π-π* transition. Treatment of AIE-S with Cu2+ shifted the absorption with two peaks at 330 and 400 nm, indicating the coordination of AIE-S with Cu2+. The stoichiometry of the complex was also determined to be 2:1 by a Job Plot indicating two AIE-S molecules bind to one Cu2+ ion (Fig. 3). The turn-off responses of AIE-S towards Cu2+. The addition of increasing concentrations of Cu2+ (0-20 μM) gradually quenched the fluorescence of AIE-S (20 μM). Spectra were taken in HEPES (10 mM, pH 7.4, 25oC, 10% THF) immediately after the addition of Cu2+ (λex 350 nm). (a) Spectra collected between 490-675 nm. 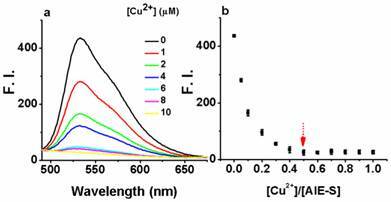 (b) Correlation between the fluorescence intensity at 533 nm of the system (y) and the molar ratio of Cu2+ to AIE-S (x). Job's plot for determining the stoichiometry of AIE-S and Cu2+ in HEPES (10 mM, pH 7.4, 25oC, 10% THF). The total concentration of AIE-S and Cu2+ was 20 μM and the excitation wavelength was 350 nm. The selectivity of AIE-S to Cu2+ over other cations was then evaluated and it turned out that the fluorescent turn-off response of AIE-S was selective and specific for Cu2+. None of the other cations, including Ag+, Al3+, Ca2+, Cd2+, Co2+, Fe2+, Fe3+, Hg2+, K+, Mg2+, Mn2+, Na+, Ni2+, Pb2+, and Zn2+ was able to generate any obvious quenching effects. Moreover, the fluorescence of AIE-S could still be quenched by Cu2+ in the coexistence of competitive cations mentioned above, indicating that the coordination effect of AIE-S was specific towards Cu2+ (Fig. 4). Fluorescence responses of AIE-S towards various cations with or without the presence of Cu2+. Data were obtained as the fluorescence intensity at 533 nm (λex 350 nm) in HEPES buffer (10 mM, pH 7.4, 25oC, 10% THF) right after treating AIE-S with the cation indicated. The concentrations of AIE-S and the cations were both 20 μM. For the coexistence experiments, both Cu2+ and the tested substrates were kept at a final concentration of 20 μM. To confirm the mechanism shown in Fig. 1, dynamic light scattering measurements were carried out which showed that AIE-S probe has an average diameter of 249.0 nm in HEPES buffer (10% THF), while treating the probe with Cu2+ decreased the aggregation with the average diameter reduced to 169.2 nm (Fig. 5), supporting a plausible mechanism based on copper-initiated de-aggregation. Size distribution of AIE-S (20 μM) before (a) and after (b) the addition of 0.5 eq Cu2+ in HEPES (10 mM, pH 7.4, 25oC, 10% THF). Data were determined by dynamic light scattering. Having established AIE-S as a Cu2+ selective complexing ligand, we next study the ability of the AIE-S-Cu system to sense H2S. For this purpose, Na2S was employed as an aqueous sulfide source. Much to our delight, the addition of Na2S to the weakly emissive AIE-S-Cu solution triggered an immediate increment in fluorescense intensity, demonstrating the release and aggregation of AIE-S (Fig. 6). The signal response towards Na2S was instant and maximized within seconds since the fluorescent spectrum obtained right after the addition of Na2S (t < 1 min) was overlapped with that of 30 minutes (Supplementary Material: Fig. S3). Moreover, the logarithm of the fluorescence intensity growth ratio of the system was linear to the concentration of Na2S ranging from 2-15 μM with a correction coefficient of 0.985 (Fig. 6c). To examine if the fluorescence switch-on property of the AIE-S-Cu complex was specific towards sulfide, its responses towards various common anions and biothiols in HEPES buffer were measured. As shown in Fig. 7, in the presence of various anions, including bio-relevant F-, Cl-, Br-, I-, H2PO4-, NO3-, CO32-, ClO-, and sulfur oxyanions such as SO32-, SO42-, S2O32-, only S2- was able to induce a significant fluorescence enhancement. Moreover, common biothiols such as glutathione (GSH) and L- cysteine (L-Cys) which are the major interferents jeopardizing the specificity of reported H2S probes, proved to be innocent in this case (Fig. 7b). What is more, Na2S could still induce a great fluorescence enhancement in the presence of the competitive anions. These results taken together demonstrated the high selectivity of the AIE-S-Cu complex for H2S and its feasibility to detect H2S in the complex biological samples. 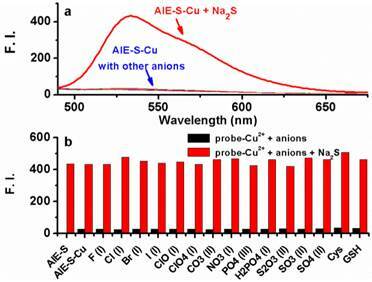 The fluorescence turn-on responses of AIE-S-Cu towards Na2S. (a) Fluorescence spectra of AIE-S-Cu in the presence of various concentrations of Na2S. Spectra were taken in HEPES buffer (10 mM, pH 7.4, 25oC, 10% THF) instantly after the addition of Na2S (0-25 μM). The concentrations of AIE-S and Cu2+ were 20 and 10 μM, respectively (λex 350 nm). (b) Plot of fluorescence intensity at 533 nm vs concentrations of Na2S. (c) Regression equation between the logarithm of the fluorescence intensity (mean ± SD, n = 3) growth ratio at 533 nm (y) and the corresponding concentration of Na2S (x). I0 was the fluorescence intensity of the quenched AIE-S-Cu. 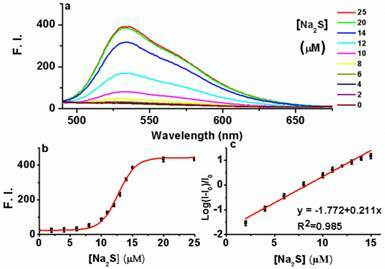 Fluorescence emission spectra of the AIE-S-Cu (20 μM for AIE-S and 10 μM for Cu2+ ) in HEPES buffer (10 mM, pH 7.4, 25oC, 10% THF) right after the addition of Na2S or other biologically relevant anions, biothiols (20 μM) (λex = 533 nm). (a) Spectra collected between 490-675 nm. (b) Emission intensity at 533 nm (y) when different species (x) were added. As a proof of concept we tested the probe in cellular imaging for the detection of sulfide. HeLa cells were incubated with the combination of AIE-S (5 μM) and CuCl2 (3 μM) for 2 h. The cells were then rapidly washed with PBS and only weak fluorescence was observed under microscopy (Fig. 8a). The cells were then treated with Na2S (100 μM) for 15 min at 37oC and resulted in a dramatic increase of intracellular fluorescence (Fig. 8b), which demonstrated the feasibility of AIE-S to image sulfide in live cells. We have devised a novel fluorescent probe, AIE-S for the sensitive and rapid detection of H2S in living cells. AIE-S featured with high selectivity, rapid response and aggregation-induced emission characteristics. The preparation of AIE-S is operationally simple and the light-up mechanism is based on S2- initiated de-coordination and thereafter aggregation of the AIE-S-Cu complex. This probe enables monitoring of H2S in solution and in cells with a high signal-to-noise ratio. Imaging H2S in live cells with AIE-S-Cu. Intact HeLa cells were treated with a combination of AIE-S (5 μM) and CuCl2 (3 μM) for 2 h and then washed quickly with PBS for imaging (a). The cells were then treated with Na2S (100 μM) for 15 min which resulted in a dramatic increase in intracellular fluorescence intensity (b). Images were collected upon excitation using the corresponding filters for DAPI (blue). (c, d): Bright field images of live cells in panel a and b. Scheme S1, Fig.S1 - S3, etc.